Hurray, the sun has returned! The temperatures are rising every day. Over the weekend, however, we were not so lucky. It rained pretty much the entire time. Late on Sunday, the clouds started to break, and I took that opportunity to get out and about with my son and my camera. 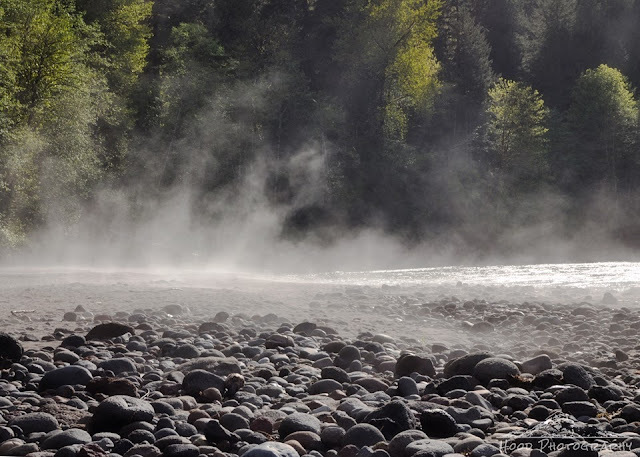 The sandy banks along the Sandy River were starting to warm, and the steam coming off them created a cool effect. That looks like such a delightful place to be. It is going to be in the high 90's today in Phoenix, and I am already tired of summer. I think I need a vacation! It really is a beautiful effect! It is a nice effect! That steam certainly made for a great shot!